Limited to the Different in Strike Price of the call options Less Net Premium Collected for the spread. Limited to the amount of net premium collected from the spread. This is a net credit spread as you sell a lower strike call (collect higher premium) and buy a higher strike call (pay lower premium) of the same expiration date. 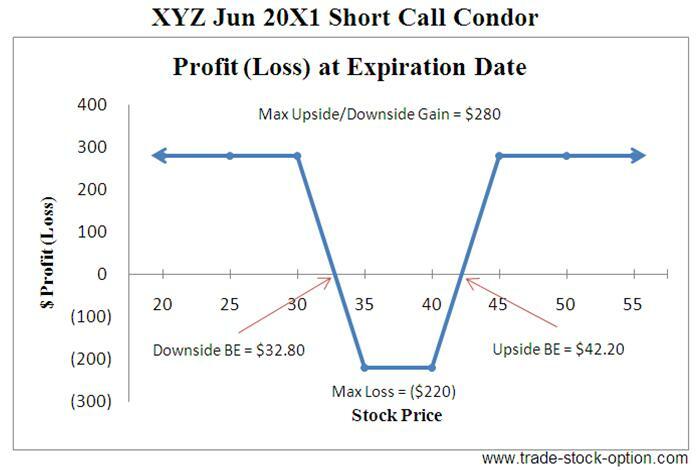 Time erosion of options values help trader of this strategy when it is in a profit position but is harmful to the trader if it is in a loss position. May profit from three scenarios: underlying stock price fall, move sideways, or rise by a relatively small amount. Reduce the upward risk as compared to a Naked Call Strategy. Exit strategy is determined in advance when placing the spread. Profit potential is limited to the Net Premium Collected if the underlying stock price falls. Maximum loss is typically greater than the maximum gain, even though the upward risk is capped. Simply offset the spread by buying back the call options that you sold and selling the call options that you have bought in the first place. As the underlying stock fluctuate up and down, advance option traders may choose to unravel the spread leg by leg. In this way, the trader will leave one leg of the spread exposed while he profit from the closure of the other leg. 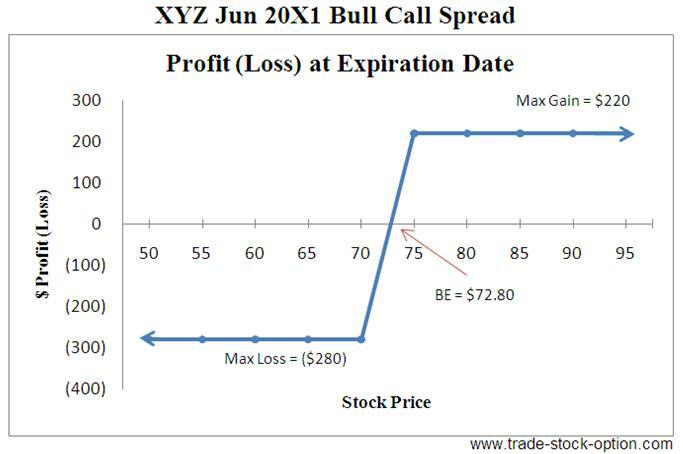 Assumption: XYZ is trading at $84.90 a share on Mar 20X1. 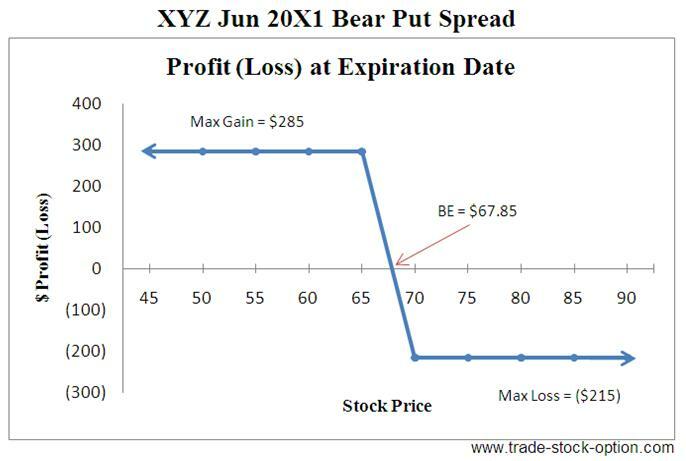 You are expecting share price of XYZ to fall or at least moving sideway. However, you do not wish to trade a naked call strategy due to the unlimited risk exposure involved. 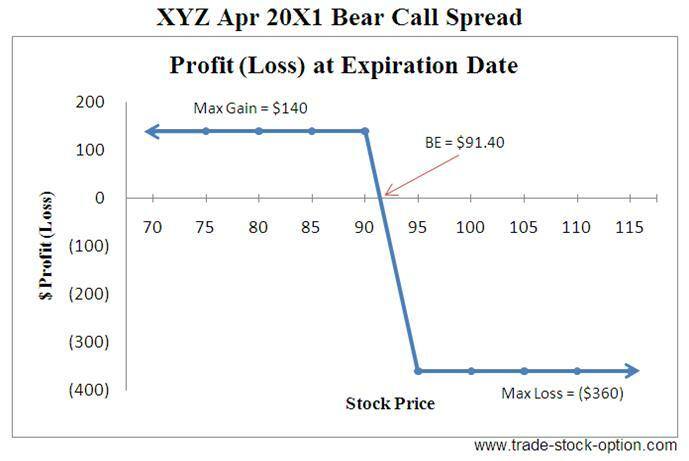 In this case, you may consider to sell one Apr 20X1 $90 strike call at $3.00 and buy one Apr 20X1 $95 strike call at $1.60 to profit from the bearish to neutral outlook of the stock. Note: commissions are NOT taken into account in the calculation. Maximum Reward = Net Premium Collected = ($3.00 - $1.60) * 100 = $140. 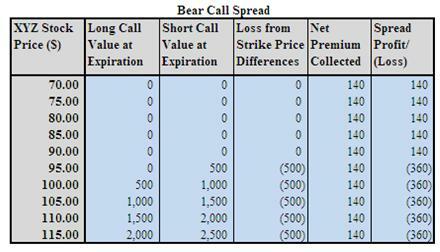 Bear Call Spread is a vertical spread strategy that creates a net credit position in your account. When you entered into this spread, you are moderately bearish on the underlying stock and are looking for a way to earn income from the bearish outlook while limiting the risk exposed. It usually involves selling out of the money call options and buying further out of the money call options with the same expiration date. The sold calls will produce the income element for the trade and the bought calls will have the effect of limiting your risk exposed. Try to ensure that the underlying stock is in a downward trend or trade within a limited range of stock prices when you are using this strategy. Identify a clear area of resistance. Therefore it is preferably to use this option trading strategy on a short term basis with about 1 month left to expiration so as to give yourself less time to be wrong. Use the same expiration date for both legs of the call. There are literally thousands of Bear Call Spread combinations available. Each has its own unique risk, reward, time frames, volatilities characteristics and probabilities of success. You should pick the combination of the spread according to your risk/reward tolerance and forecast outlook of the underlying stock. Selecting the option trading strategies with appropriate risk-reward parameters is important to your long term success in trading spread.